Arizona-based automaker Local Motors, a vehicle technology integrator and creator of 3D-printed cars, has introduced the first self-driving vehicle that comes with the cognitive computing capabilities of IBM Watson. The vehicle, called ‘Olli,’ can carry up to 12 people, and is being used on public roads locally in DC, says the company. Passengers will be able to interact conversationally with Olli while traveling from point A to point B, discussing topics about how the vehicle works, where they are going, and why Olli is making specific driving decisions. Yes, it can provide answers to “Are we there yet?”says the company. Passengers can also ask for recommendations on local destinations such as popular restaurants or historical sites. 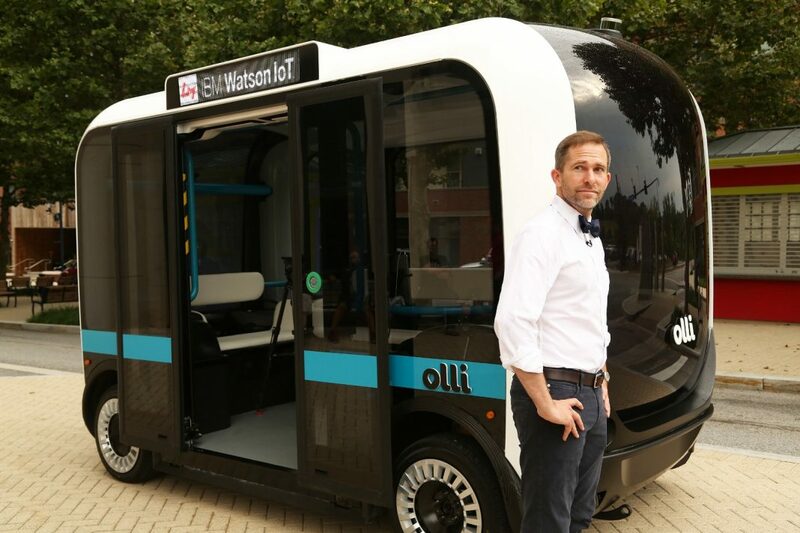 Olli utilizes the cloud-based cognitive computing capabilities of IBM Watson IoT, says Local Motors. The vehicle can analyze and learn from transportation data, produced by the 30+ sensors embedded throughout the vehicle. The Olli platform also leverages four Watson developer APIs — Speech to Text, Natural Language Classifier, Entity Extraction, and Text to Speech — in interactions between the vehicle and passengers. Olli will start operating in Miami-Dade County and Las Vegas later this year.